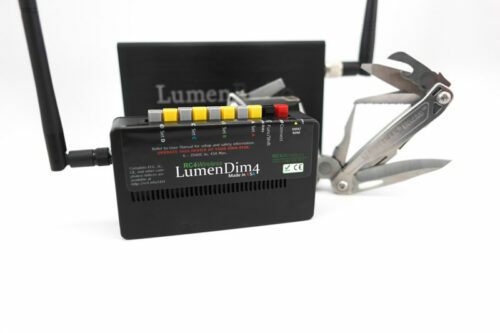 This little receiver outputs wireless DMX data in a package the size of a DMX2dim — ideal when using battery power (6V to 35VDC) in a limited space. 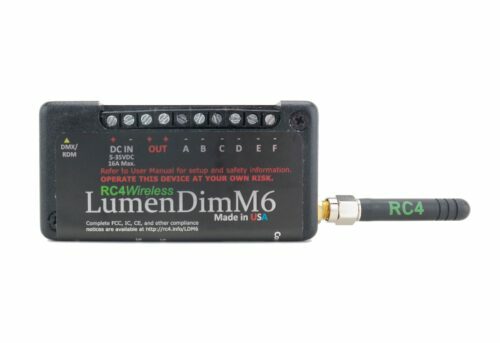 Just like a DMXio in receiver mode, the DMXmrx delivers wireless DMX data in a package the size of a DMX2dim — ideal when using battery power (6V to 35VDC) in a limited space. An RC4DMX5F 3.5mm miniplug to 5-pin female XLR adaptor is included, making it easy to plug into any standard DMX fixture. An AC adaptor with wire tails is optionally available for situations where 90 – 250VAC is accessible. This is the perfect data companion for a fixture positioned in an unusual location. Velcro or tie-wrap the DMXmrx to the fixture, connect the XLR cable and power, and you’re ready to go. <pDMX Input/Output: RC4 3.5mm mini, USITT DMX512/1990 data, non-standard port. RC4DMX5F miniplug to female 5-pin XLR adaptor cable is included. Power Input: 6VDC – 35VDC, 0.4W idle draw, screw terminals. Sensors: Input voltage, internal temperature.